Oceanfront Timberframe Cottage is a rare treasure. With vaulted 14-foot beamed ceilings, mahogany countertops, a stone fireplace, wide pine floors, and a spacious great room/kitchen, this house is cloistered in a seaside setting just a few miles from downtown Plymouth -- with easy access to sightseeing, whale-watching, deep sea fishing, antiquing, boutiques, golf, historic homes, beach combing, and swimming. From the oceanfront breezeway, you take in the breathtaking view sweeping from Plymouth Harbor over to Provincetown. There are vivid sunsets over the water, and at night you can see the twinkling lights of Plymouth, the beacon from the Gurnet lighthouse across Plymouth Bay, and the outer arm of Cape Cod on the eastern horizon. Stepping inside, you enter the Great Room with its stone fireplace, timber trusses, barn-wood ceiling, and wall of glass looking out on the ocean. Attractively decorated with white slip-covered furniture, the Great Room has wide pine floors with forged nails and antique cupboards with beveled-mirror doors (reflecting the ocean view). The kitchen runs the length of the Great Room and has a 14-foot long mahogany-topped island with two undermount sinks/Grohe faucets, dishwasher, induction cooktops, and a Miele convection oven allowing the cook (or master of canapes and wine) to be part of the family gathering while enjoying the wraparound view. The fireplace is flanked with massive antique Ottoman doors, brought back from Cyprus, which divide the Great Room from the original master bedroom. Just off the Great Room is a raised sleeping alcove that juts out toward the ocean and features a queen-size four-poster British West Indies bed. 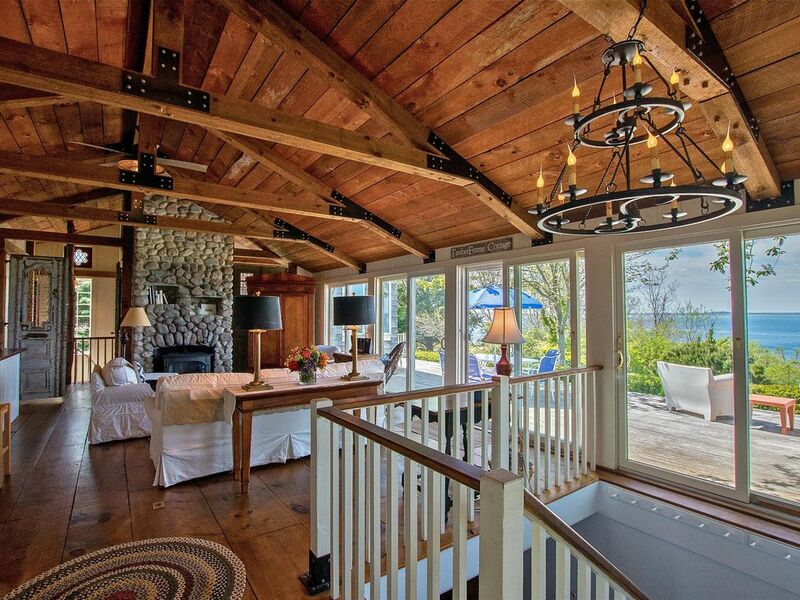 Here, posts and beams create a jewel box with ocean views all around. The high windows let you peer at starlight high above the Atlantic. The bedroom's French doors open onto the wraparound mahogany deck — with outdoor shower with light house and ocean views — that connects all around to the Great Room and kitchen. The open floor plan offers flexibility for those with just 2 couples wanting space and luxury, or larger families with children spilling into the spacious lower level with its own full bath (laundry room is also on lower level). We provide everything you can imagine for your comfort and convenience at the house: Ample nice linens, towels, beach towels, laundry supplies, a well-stocked kitchen with spices, oil, condiments, and baking needs, Ice maker, Miele convection oven, induction cooktops (so you can move them and cook facing the ocean) quality pots and pans, nice dishes, quality wine glasses and glassware, silverware, small appliances, toaster, paper goods like coffee filters, paper towels, bathroom tissue, napkins, excellent, up-to-date air-conditioning, two gas fireplaces, quality Weber gas grill with propane, firewood for the fire pit, easy access to Plymouth Long Beach just 2 miles away, or (depending on availability) parking for one car at our House by the Sea where we have a magnificent private Hawaii-like beach. The neighborhood is very interesting. It used to be the elaborate Stone Estate, a magnificent spread with mansion, stables, gardener's cottage, caretaker's cottage, pool house with saltwater pool, polo field with stone ramparts, and a guest house modeled after the tea house at Versailles. If you remind me, I will send you an aerial photograph of the estate from the 1930s which shows the extensive grounds, buildings and hinterlands of forested oceanfront acreage (where our house now sits). Downtown Plymouth has great restaurants, a live music scene, and interesting shops, pubs, and parks. Nearby are Plimoth Plantation, which is like a trip in a time machine back to the 1600s, Plymouth Rock, whale watching, historic homes, and many other attractions. From Oceanfront Timberframe you can make day trips to Boston, the mansions of Newport, and the Cape — where you can catch the ferry to Martha’s Vineyard or Nantucket. A summer ferry also connects Plymouth and Provincetown, avoiding a long car trip. Then again, you may never want to leave oceanfront Timberframe cottage, because it is so beautiful and peaceful. TO RESERVE, give us your dates, number of guests, length of stay. When we have something worked out that makes you happy, just email me with YES and I will send our friendly one page PDF rental agreement. 50% personal check is due within four days, the balance is due three weeks before you arrive. 13% tax is included. Final cleaning fee is $275, which you write as a personal check which stays in your file. It is mailed back to you if you choose to leave the house exactly as clean and ready as it was when you walked in. (Many people do, many people don't.) Hope to see you soon. To me, creating the perfect waterfront getaway home is an art form. My lifelong career had been in designing publications, and later creating magazine illustrations (google 'robin jareaux') and painting expressionistic works on canvas. When I first decided to rent my weekend home so I could renovate an incredible but dilapidated cottage (which became, at great expense, 'Timberframe Cottage') I did not know this would become my work and my passion. Working in 2-D was fun and rewarding, but my new 3-D art is creating vacation homes that themselves are 'works of art.' My goal with my homes is to create a setting that exceeds your expectations, and in turn, your patronage lets me continue my art form a few more years. Please read the guest comments to see the generous and enthusiastic compliments we've received. Finding just the right furnishings, using classic Nantucket decor, using materials such as massive beams, barnwood ceilings, wide pine floors, antique cabinets, and creating gardens overflowing with roses and peonies, clematis, daylilies, gigantic buried stepping stones, blueberries, raspberries, foxgloves (can you tell it is June as I write this?) expanses of mahogany countertop, fine appliances, stone fireplaces, stained glass, with views that will take your breath away. Please look at 'all my rental listings' to see my portfolio: art in the form of unique and exceptional vacation getaways. It is a labor of love... for you. Jaw-dropping Incredible wraparound ocean views, a light house across the water, fireworks over the sea, utmost privacy, this is EDEN. The reviews give a few hints and the joy people feel being here. And many guests come time after time. AND NOW, we have completed a long anticipated renovation which nearly doubles the size of the oceanfront parts of the home. 4 shoreline miles from Plymouth Rock and historic downtown Plymouth. 11 miles to Cape Cod. An easy 45 miles (be sure to travel off peak!) to Boston. Zero miles to bliss. Double system splits units at both ends of the vaulted first floor and on the lower level keep the house cool in the summer and act as heat pumps in winter (down to zero F). Basic CD player. Any audiophile would want to bring his/her favorite music and amplification. Somewhat dated now, as DVDs fade out, but still some gems you might enjoy. For our mobility-impaired friends, most amenities are on one level, and while we regret we do not have a wheelchair ramp, the house is very easy to access from the drive up to the breezeway to the main living area. Immaculately maintained. Extradordinary setting. The cottage has everything you could ever need. What a wonderful and special place. What are you waiting for? Stay HERE! Our family of 5 enjoyed the most wonderful week here. The brand new suite used by the newlyweds in our family was a big plus. The house is comfortable, cozy, luxurious, glorious. The view takes your breath away. The house is mostly one level (except for the basement rooms) so was easy for us older folks and our older dog to navigate. The kitchen and all its appliances were amazing. We worked well in the kitchen together without getting in each others way. The homeowners, Robin and John are terrific and very responsive. Full instructions on how to use everything in the home are readily available. I just can't begin to describe what an easy to use, comfortable home this is, and the glory of the view. The location of the property especially in proximity to EVERYTHING Plymouth has to offer, as well as if you want to go to Cape Cod, it's 20 minutes away at most. What are you waiting for? Book this house. You will have zero regrets! We arrived at Oceanfront Timberframe for a short "getaway" weekend in the midst of an October Nor'Easter. Inside it was warm and cozy and we enjoyed our view of the white caps and rolling waves. The well-appointed kitchen eased the burden of preparing dinner and watching the Red Sox on TV contributed to our after-dinner enjoyment. Robin, the owner, keeps Timberframe in immaculate condition, much appreciated by us. Our small dog was also appreciative of the location on a long dead-end street which made walking safe and enjoyable. The weather improved somewhat during the next two days but we were still not able to take advantage of Timberframe's inviting outdoor spaces --- although the million dollar view was easily visible through the big picture windows. That means we'll need to schedule another visit so that the next time we can enjoy ALL that Timberframe offers, inside and out. This is a fabulous property with stunning views of Cape Cod Bay. Property was well furnished and in excellent condition. I choose this property for a friends week-end, all from out-of-state - all had a great time and were amazed at the views and the property. Nice touch was that the kitchen was fully stocked with everything we would need, so it was like cooking at home. Beds and accommodations were very comfortable. Robin was excellent to work with and helped us get the most of our long weekend stay. Definitely looking for another opportunity to return to this property in the future. Our family enjoyed this spot of heaven. The view is breath taking and the home is comfy and cozy. The cottage is centrally located and close to restaurants, shops,and all things Plymouth. We would certainly stay here again. So glad this nice family enjoyed this "spot of heaven!" With "hygge" being the trendy Danish term for "a quality of coziness and comfortable conviviality that engenders a feeling of contentment and well-being" I do believe we've achieved "hygge" (pronounced HOO-geh.) But if small comes to mind when you think of "cozy" may I just point out that the main house including Great Room and master bedroom area of Oceanfront Timberframe has vaulted 14 foot ceilings and wraparound glass to take in the spectacular ocean view. The charming breezeway is also vaulted with beams to 12 feet, and the new master suite addition has asoaring ceiling with dramatic beams over the bedroom and oceanfront bathroom as well. So "cozy", with the fireplace and fire pit and charm and woodwork, yes... but maybe also "dramatic, uplifting, extremely private, and incomparable." And it is comfy, too, and even "cozy." Gazing at the Amazing View, Relaxing, Decompressing, Historic Sites, Beaches, Biking, Sightseeing, Boutiques, Antiques, Seafood galore!, napping Reading, working while relaxing, Drinking, Sunbathing, FOOD, Beachcombing, Exploring, Whale Watching, deep sea Fishing tours, etc. AMENITIES: The home is provisioned with a VAST array of amenities: a well stocked kitchen with spices, condiments, paper goods, soaps, we also provide nice linens, towels, beach towels, starter supples of paper goods, fire wood, propane for grill. PAYMENTS: HomeAway requires online payments. Rental agreement requires that you Visa/MC serve as placeholder security deposit, like at a hotel, and stays in your file. Cleaning is refundable if the house is left as clean as when you arrived. If any cleaning is needed first hour is $85 and each additional hour is charged at $60/hour. One pet allowed via booking, other needs please add to rental agreement via owner. CANCELLATIONS: Regardless of the "Manager's Cancellation Policy" (below) please understand that any 100% refund is provided by your purchased trip insurance If your refund is not granted by trip insurance because it is a non-emergency, your refund may be covered by the manager/owner less 50% relisting fee subtracted from your deposit paid.